1. Walk and talk Take your baby along with you as you go about some of your normal tasks in the household. You can easily hold them at your hip, or you can try a baby carrier. Whilst they're with you, tell them about your day, what you are doing and be descriptive. You might feel silly at first, but there's no need; you're letting your little one hear lots of fun language that will help them when the time comes for them to start making their own sounds. Just keep on talking, and you'll see how much they enjoy the sound of your voice. My eldest was my laundry buddy and would enjoy the fresh air outside whilst I put the laundry on the line. I'd tell him the colours of the items I was hanging up and whilst the neighbours (if they heard me) might have thought I was losing it, he was having a great time learning about colours. 2. Look at my tongue Sit with your baby and try to encourage them to imitate you. A really easy one is to stick your tongue out and then back in again and keep doing this. It won't be long until they are trying to copy what you are doing. If your baby isn't catching on, try copying what they are doing, and they'll soon have the hang of it and you'll enjoy all the new facial expressions they can do. 3. Body parts. When you are changing a baby's nappy or getting them ready for nap time, tell them all about their body. You can let them know where their feet are, their hands, their tummy, their nose and all the other parts of their body that come to mind. All the time you are doing this, keep talking to them and they'll love hearing these new words. Once they are a little bigger, use your hands to show them where there toes are etc and they'll soon turn their heads to look at what you are doing. 4. Textures Whilst you are sitting next to your baby, look around you and see what textures you could show your little one. You could scrunch up some paper to show them what that feels like, or perhaps you're wearing something silky that they might like the feel of. Little distractions like this help introduce your child to the wide world of textures, and by letting him hold and touch items, their coordination will also improve. 5 Reflection Babies seem to love looking in the mirror, so grab a baby mirror or use the bathroom mirror and let your baby look at themselves. If you are holding them, you can point to yourself and say 'Mumma' or 'Dadda' and then point to them and say 'Baby'. Strangely, up until around 9 months of old, a baby won't actually make the connection that it is them in the mirror, so it's a fun little game where they'll happily stare at themselves for ages and this will help them to focus where they are looking. 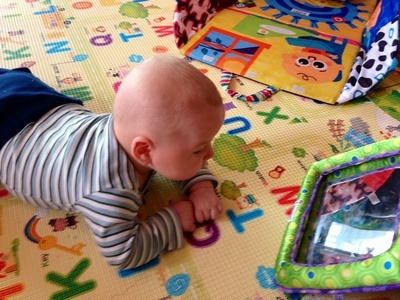 Do you have any little games that you played with your baby that you both enjoyed? Best indoor playcentre for kids in Perth?